I started writing this on the 1st of May, and I just could not get into it, partly because sometimes a scent just eludes pinning down by words, and partly because Blogger was down for a couple of days, and partly because I got a Kindle and I have been distracted by reading. But the real reason, it finally occurred to me, is an increasing feeling of pointlessness. Who, I kept asking myself, wants to read about a scent that was released three or twelve or nineteen years ago? (I mean, I do, but I'm not everybody, to say the least, and it is getting harder to convince myself that other people want what I want.) What people mostly want to know about is the newest scents: that's why Now Smell This is such a huge deal. And I am cut off from all but the mass-market scents: I live in a very small city, where "niche" is a meaningless word, and I am in the middle of a self-imposed year-long moratorium on new fragrances--I have a completely insane quantity of them, and I can't justify buying any more, not even samples. So I look through my collection or fish through my samples, and I think, "Eh, what's the point?" But I'm working through it. Writing is its own pleasure. "Ultimate Fusion"? "Flaming Rock"? What? Keep in mind that although this was well into the Age of Calone and the bright ozonic freshness that entailed, it preceded the current era in which the seeming majority of commercial scents, men's and women's alike, have a fresh, aquatic, or clean-scrubbed quality. Although Odeur 53 does have that clean freshness, it's not the jumped-out-of-the-shower clean you can't avoid these days, but an industrial and slightly scary rigorousness, like a dishwasher factory or an atomic death ray. In a surprising coincidence, Odeur 53--named for the 53 scent elements which comprise its formula--shares that "burnt rubber" note with Bulgari Black, which was launched the same year and is also strange in a very different way, though if you had to adjudge one of them as "conventional", or at least "less unconventional", it would be the vanilla-drenched Bulgari, for sure, which moved from the avant-garde into, if not the mainstream, then the acceptable during its lifetime. Odeur 53 still carries a whiff of the bizarre, even if you hadn't read its list of notes. 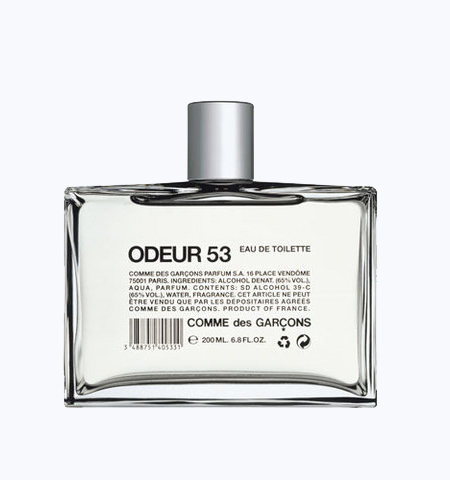 Everything about Odeur 53's public face screams "synthetic", and it and its successor, Odeur 71, were pretty obviously test runs or at least inspirations for CdG's Synthetic series in 2004: Odeur 53 is very reminiscent, in part, of Dry Clean and Skai. But Odeur 53 is not just synthetic. It is multi-faceted, and some of the facets are invented versions of natural scents: there's a gust of vetiver in there, with to my nose the celery note that sometimes attends vetivers, and a dry woodiness that could be (but isn't) cedar--more like the spirit of wood than wood itself. (Perhaps that's the "pure air of the mountains".) This is all rather confusing--with its bizarre list of notes and its mad jumble of real-fake and fake-fake, it seems at times like a psychology experiment--and what is more, it is not absolutely, uniformly attractive: occasionally I will get a little whiff of something unpleasant, perhaps aggressively clean or overly fresh or teeth-grindingly synthetic, that makes me wonder why I put it on my skin. But most of the elements are, if not beautiful, then fascinating, and that's better, sometimes.